When I need to be uplifted When I need to be redeemed When I need a good cry When I want to remember When I need to be distracted When I want to feel Music gives. Much like prayer, music is my healing. Music is my language. When I was a love-struck teenager, I had a notebook filled with song lyrics. Later, I made mixtapes. Much later, I dedicated songs to people in my life. Now I'll hear a song and it's like I'm right back in that place... Good or bad. I sing to my husband. I hum all the time. I hum songs to put the kids to sleep every night. 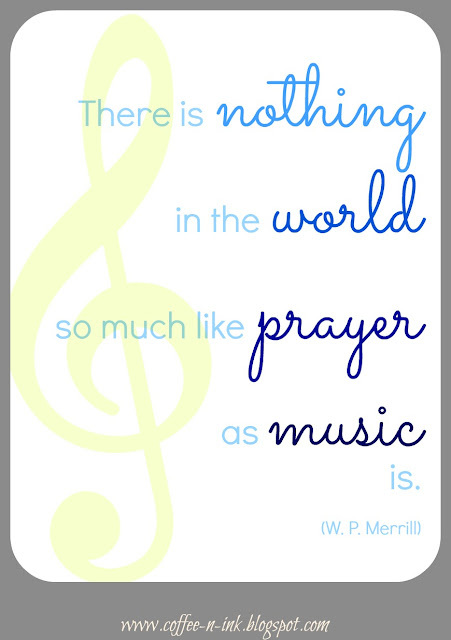 Music is also my favorite form of worship. When I need to feel closer to Him or need guidance, I turn to songs of worship. I did just that this morning as soon as I sat down at the office. And now I don't feel as overwhelmed. I feel better. I am in peace again. Music is my lifeline, I suppose. Music and Writing. Yes...that's pretty much what makes me happy. Oh, wait... Coffee. Coffee is very important. You know the simple things in life. :) Oh and I'd love to know... What song(s) just do it for you?